The Norsk Folkemuseum is Norway�s largest museum of cultural history. 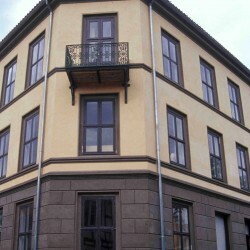 With collections from around the country, the museum shows how people lived in Norway from 1500 to the present. The more than 150 buildings in the Open-Air Museum represent different regions in Norway, different time periods, as well as differences between town and country, and social classes. The Gol Stave Church dating from 1200 is one of five medieval buildings at the museum. The contemporary history is enlightened through exhibitions and documentation projects focusing especially on children, youth and the multicultural population. Permanent indoor exhibitions include folk art, folk costumes, toys and Sami culture. There is also a variety of temporary exhibitions and audience programs all year round. Permanent exhibits feature Norwegian culture and traditions. Temporary exhibits feature selected topics and current issues. The Open-Air Museum feature old historic buildings. Every Sunday, we demonstrate baking “lefse”. The Grocery Store sells old-fashioned sweets. In the Old Town, you can see how the working class lived in the 1800s, and in the Farmhouse from Grøsli you can hear about life on the farm in earlier days. Selected Sundays we have family programs. A major attractions is the annual Christmas Fair the first two weekends of December. The Open-Air Museum is decorated according to earlier traditions, and you can see how our ancestors used to celebrate the Christmas Holiday. A Christmas marked, choral concerts, folk dance and activities for the children will bring you in the Holiday spirit. Norsk Folkemuseum contains comprehensive indoor exhibits located in the buildings surrounding the Square: Norwegian Folk Art, Norwegian Folk Dress, Norwegian Church Art, Sami Culture, Old Toys and temporary exhibits. The museum also has a large Open-Air Museum with the Collections of King Oscar II, including the Stave Church from Gol, farm houses from various rural districts in Norway and the Old Town with the Apartment Building - Wessels gate 15. The exhibits feature daily life and living conditions in Norway from the 16th century to the present. Norsk Folkemuseum has comprehensive and diverse collections of artefacts, buildings, photographs and an archive of documents and records.. These collections represent to a large extent Norwegian and Sámi culture from the 16th Century to the present. The collection contain around 160.000 artifacts representing daily life and work in Norway from the 16th Century to the present time. The artifacts are from both urban and rural areas throughout Norway and are linked to home and domestic activities, farming, skilled labour, folk art and crafts. There are collections of folk dress, textiles, folk art, weapons, toys, musical instruments and church art. The museum also has a unique collection representing Sami culture. Much of the older collections are from the 18th and 19th century, but in recent years, the museum has focused on collecting artifacts from the 20th century. The museum�s large photo archive has photos, prints and other visual material, predominantly from the 1850s to present. The photos are taken by both professional and amateur photographers. Norsk Folkemuseum has also done extensive photo documentation related to research projects and field work, as well as public museum events. The museum�s extensive archives and records contain material from around 1800 to the present. The archives and records include documents from private contributors as well as Norsk Folkemuseum�s research and history. By buss: Buss 30 Bygdøy from downtown Oslo to Folkemuseet. By ferry: March 15 – October 12: Ferry no. 91 from Rådhuskaia to Dronningen. Walking distance 10 min. to Norsk Folkemuseum. By car / on foot: From highway E 18 or from road Bygdøy Allé, follow signs to Norsk Folkemuseum. Parking: Outside the main entrance. Parking fee every day all year, 08.00 – 18.00. NOK 7 pr. hr. NOK 30 pr. day.